There is an urgent need for disease-modifying treatment of Alzheimer's disease starting at its very onset. But conventional approaches cannot measure brain region-specific biomarkers of the earliest dysfunction underlying abnormal behavior in living patients. Often, spatial disorientation is observed during the early onset of Alzheimer's disease, and its occurrence predicts later dementia. One brain region important for spatial memories is the hippocampus. Oxidative stress in the hippocampus occurs at the very start of Alzheimer's disease. Yet, it has not been possible to prove that this very early oxidative stress in the hippocampus causes impaired spatial memory because conventional methods only measure oxidative stress from post-mortem tissue. But a study led by a Wayne State University School of Medicine researcher shows, for the first time, that a specific type of magnetic resonance imaging offers a method around that obstacle. In the study, "In Vivo Imaging of Prodromal Hippocampus CA1 Subfield Oxidative Stress in Models of Alzheimer's Disease and Angelman Syndrome," Bruce Berkowitz, Ph.D., professor of Anatomy and Cell Biology, and his colleagues demonstrate that QUEST MRI has the potential for personalized detection over time of above-normal production of free radicals and antioxidant treatment efficacy in localized regions of the brain in living patients. QUEST MRI also appears to be useful for measuring brain region-specific biomarkers of the earliest dysfunction underlying abnormal behaviors. The National Institutes of Health recently awarded a multi-principal investigator grant titled "Novel Imaging Biomarker for Treating Spatial Memory Loss in Prodromal Alzheimer's Disease Models" (R01 AG058171) to Dr. Berkowitz, Ph.D., (lead principal investigator); Associate Professor of Family Medicine and Public Health Sciences Robert Podolsky, Ph.D. (WSU); Professor of Physiology Geoffry Murphy, Ph.D. (University of Michigan); Professor of Pharmacology Olivier Thibault, Ph.D. (University of Kentucky); and Professor of Biomedical and Molecular Sciences Brian Bennett, Ph.D. (Queen's University) to further study the effectiveness of QUEST MRI in detecting the earliest indicators of Alzheimer's and other neurodegenerative diseases. The results of the proposed experiments will directly measure this oxidative stress burden in two models representing spontaneous and familial Alzheimer's disease. The transformative imaging method developed at the Wayne State University School of Medicine enables earlier evaluation of disease progression and anti-oxidant treatment efficacy than is currently possible, and importantly, is translatable to the clinic in Alzheimer's disease and other oxidative stress-based diseases. The first publication of this work was recently published in The FASEB Journal's September issue. The journal is the official publication of the Federation of American Societies for Experimental Biology. 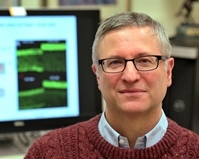 "Our results directly confirmed that continuous production of biologically relevant free radicals are readily detectable using QUEST MRI," said Dr. Berkowitz, professor of Anatomy and Cell Biology, and of Ophthalmology, and director of the Small Animal MRI CORE facility at WSU. "QUEST MRI is a promising in vivo paradigm for bridging brain subfield oxidative stress and behavior in animal models and in human patients, to better manage antioxidant therapy in devastating neurodegenerative and neurodevelopmental diseases." Free radicals are natural byproducts of chemical processes in the body, including metabolism. But an overabundance of free radicals - more than the body can normally neutralize - can lead to oxidative stress, which can alter cell growth and possibly lead to a number of diseases and conditions, including Alzheimer's disease. One major factor that determines contrast in an MRI image is a parameter called T1, which can be thought of as a lifetime measurement. Energy is put into protons of water and the time it takes to give up that energy is characterized by T1. Dr. Berkowitz's study showed that a continuous production of free radicals will shorten T1. A greater sustained production of free radicals will increase T1 proportionally. QUEST, or QUEnch-assiSTed, MRI, consists of comparing two T1 measurements, one at baseline and one after giving an antioxidant. A baseline measurement higher than normal that returns to normal values with the addition of an antioxidant indicates a brain region experiencing oxidative stress. "QUEST MRI does not require injection of a contrast agent or specialized equipment, and Food and Drug Administration-approved antioxidants can be used for the confirmatory quench," said Dr. Berkowitz, who pioneered the technique. "Our highly innovative studies by an experienced team of experts will validate a new bridging tool for testing in vivo antioxidant therapeutic strategies to mitigate a clinically important early decline in spatial memory preceding later loss of personhood in Alzheimer's disease." Those interested in contributing to the research may contact Senior Director of Gifts Lori Robitaille at lrobitai@med.wayne.edu or 313-993-4070.